Carmarthenshire council, Wales; caused by the death of Plaid Cymru councillor Alun Davies at the age of 60. He had served since 2012 and was chairman of the local constituency branch of Plaid; away from politics he was a fundraiser for the Welsh Air Ambulance. It may feel like summer has been going on for months, but the local by-election season is only now starting to wind down in advance of the summer holidays. There are six polls this week, three in the South Midlands, two in Lancashire and one in Wales, with which we start. For our Welsh poll we are in rural Carmarthenshire. 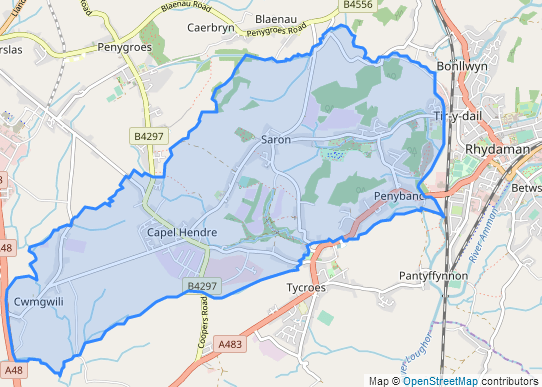 The Saron division covers five villages immediately to the west of Ammanford, a former coal-mining town and now one of the main centres of eastern Carmarthenshire. For some reason Ammanford appears on the map above under its Welsh name, Rhydaman. Despite the division’s name the largest centre of population is not Saron but Capel Hendre, a pit village of quite recent vintage: the Lyndsey Colliery operated in Capel Hendre from the 1960s to 1992, and its site is now occupied by a business park. We’re now a generation or two on from that which worked in the mines here, and that’s reflected in a declining Labour vote. Since the creation of the modern Carmarthenshire council in 1995 Saron has been competitive between Labour and Plaid Cymru, who hold the local constituency (Carmarthen East and Dinefwr) at both Westminster and Senedd level. In the 2016 Senedd election Plaid’s Adam Price returned to politics after a few years away, easily holding the Carmarthen East seat; fourth in that election and elected to Cardiff Bay from the list was UKIP’s Welsh leader Neil Hamilton, the former Tory MP who had lived in Ammanford for some years in his youth. Plaid followed up in 2017 by winning both seats in Saron division for the first time since 1999 (the 2004, 2008 and 2012 elections had seen Labour win one seat out of two). Shares of the vote were 49% for Plaid and 36% for Labour. Defending for Plaid Cymru is Alun Davies’ widow Karen, who chairs the local community council (Llandybie). Labour have gone for youth in selecting 25-year-old activist Tom Fallows, a recent graduate in philosophy and religious studies from the University of Roehampton. Completing the ballot are Aled Crow for the Conservatives and the division’s first ever Liberal Democrat candidate, Caryl Tandy. Milton Keynes council, Buckinghamshire; caused by the resignation of Labour councillor Alan Webb who had served since 2012, originally being elected for Eaton Manor ward before transferring here in boundary changes in 2014. Despite that rural Welsh start it’s the towns and cities of the southern Midlands which dominate Andrew’s Previews this week, and we start our consideration with one of the oldest parts of one of the newest towns. The village of Fenny Stratford lay on Watling Street, which in Roman times was the main route from London to the North; the Romans had a settlement here called Magiovinium from which archaeologists have extracted one of the UK’s oldest known coins, a gold Roman stater dated to the middle of the second century BC. James I gave Fenny Stratford a market charter, but the town was badly hit by the Great Plague, lost its market and didn’t really recover until the nineteenth century. By that Fenny Stratford was in the shadow of Bletchley, a neighbouring town which was a major railway junction, and never found its independent former glory again. Population growth came in the 1960s with the development to the south of the Lakes estate, which was built by the Greater London Council to take London overspill and essentially consumed the pre-existing village of Water Eaton. So by the time Milton Keynes New Town was designated in 1967, this ward was already nearly fully developed. The only existing space was north of Watling Street, which mostly got turned into industrial units: there is a large Tesco distribution centre here within the ward boundary. Milton Keynes is still growing and consequently gets new ward boundaries on a regular basis. At the 2011 census most of this area was in Eaton Manor ward, which was the Lakes estate and whose census return still screams “isolated council estate”. Eaton Manor was in the top 100 wards in England and Wales for the under-16 age bracket; Milton Keynes does have lots of jobs for when those kids grow up, but this is definitely one of the working-class ends of the New City. The 2014 boundary changes brought in Fenny Stratford, a more upmarket area which was previously in the Bletchley and Fenny Stratford ward. As can be seen, the name “Bletchley East” is a little misleading. Eaton Manor was a very safe Labour ward, but Bletchley and Fenny Stratford was a Tory-inclined marginal. The new Bletchley East has turned into a Labour ward, but not a safe one: at its first election in 2014 UKIP won one of the three seats on offer. The Kippers lost their seat to Labour in 2015, but the May 2018 result – 48% for Labour and 39% for the Conservatives – suggests that there is still work to do for the red team here. 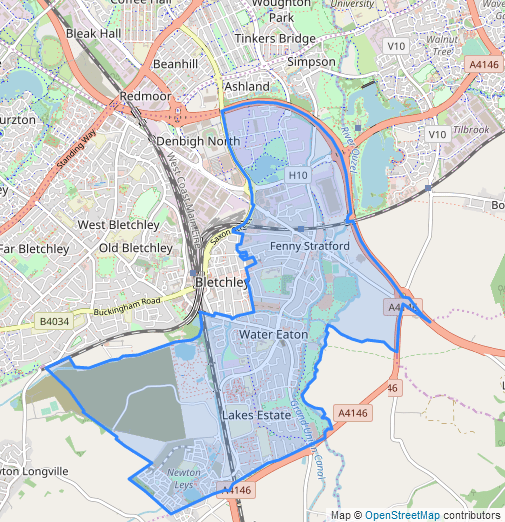 There’s also work to do for the Conservatives: the ward is part of the Milton Keynes South constituency, whose Tory MP Iain Stewart is sitting on a majority of just 1,725. Both Labour and the Conservatives have selected strong candidates. Defending for Labour is Emily Darlington, a businesswoman and trade unionist who fought the marginal seat of Milton Keynes North in the 2015 general election. The Conservative candidate Angela Kennedy is a former Milton Keynes councillor for the old Bletchley and Fenny Stratford ward. Also standing are Jo Breen for the Green Party (returning from May), Richard Greenwood for the Liberal Democrats and Vince Peddle for UKIP. And there’s one more development to report. If after reading this you’d like to stake some money on the outcome, you can. Your columnist has been in discussions with the betting exchange Smarkets, who have opened a betting market on the winner of the Bletchley East by-election. If you would like to have a flutter, go here for the link and all the instructions. Northamptonshire county council; caused by the resignation of Labour councillor Rachel Cooley after just a year in office. Chalk, meet cheese. Cheese, say hello to chalk. For our second South Midlands by-election we travel to a division of Northampton whose urban nature conceals some interesting social divides. The St George county division is centred on The Racecourse, a former centre for horse-racing. The Northampton Racecourse had tight bends and public paths crossing the course, which made it rather dangerous; after a fatal accident in 1904 involving spectators, the Jockey Club had had enough and the course closed. With it closed the Kingsley Park Hotel, a pub on the corner of the park which was owned by the Jockey Club and lay empty until the 1920s; as a result the pub, and the road junction it stood on, became known as the White Elephant. The area to the north of the White Elephant was developed for housing in the 1930s as the Kingsley Park estate, and now forms the Kingsley ward of Northampton. At the time it would have been at the edge of town; but New Town development in the postwar years means this is no longer the case. This is fairly undistinguished Middle England, full of the sort of swing voters the major parties like to court. The same cannot be said of the western end of the St George division. This is Semilong, which despite the name is not a district of long semis; it consists of tightly-packed Victorian terraces immediately to the north of Northampton town centre, running down the hill from the Racecourse to the railway line. At the top of the hill is Northampton’s Catholic cathedral, dedicated not to St George but to Saints Mary and Thomas. Those terraces don’t claim much allegiance to the flag of St George either: Semilong has seen massive population growth in recent years thanks to immigration. In the 2011 census it was in the top 60 wards in England and Wales for those born in the new EU states: the proportion then was 11.5% and it’s almost certainly higher now. Poles are particularly strongly represented, and the census return also picked up significant proportions of Chinese, Somalis, Russian-speakers and Gujurati-speakers. Given that Semilong doesn’t have many obvious new erections or developments, one suspects that either the terraces are being subdivided into flats or HMOs are a problem here, or both. So, an interesting mix. The division is split between the two Northampton parliamentary seats, which are both key marginals: the Tories held Northampton North (which covers Kingsley) last year by just 807 votes and Northampton South (which covers Semilong) by 1,159 votes. Despite that it was the Lib Dems which made the local running in Northampton during the Noughties: however, their borough administration became deeply unpopular and they crashed and burned in the 2011 borough election. Nonetheless the Lib Dems did win St George in the first election to be held on these boundaries in 2013, although it was with a low share of the vote: just 32%, to 28% for Labour, 22% for UKIP and 14% for the Conservatives. In the run-up to last year’s general election Labour gained St George division, polling 40% to 30% for the Lib Dems and 22% for the Conservatives. A look at the Northampton council results reveals that Labour hold all of the three wards covering the division. Semilong is the best Lib Dem ward, while Trinity ward (which covers the Racecourse) is a three-way marginal. The Tories’ best ward is Kingsley but their attempts to win St George are stymied by the fact that they can’t get their vote in Semilong to rise. The well-publicised financial travails of the Tory-run Northamptonshire county council and a huge scandal involving their borough council administration won’t help either. Essentially, Northampton Council loaned an eight-figure sum to Northampton Town football club for a stadium redevelopment; but the redevelopment was never finished and the club nearly went belly-up, which raises rather obvious and surprisingly difficult questions about where all the money went. The loan was signed off by then council leader David Mackintosh, who was subsequently elected as MP for Northampton South in 2015 and then was effectively forced to stand down from Parliament over the scandal at the snap election two years later. Last week Northampton council were in court, suing the former football club owner David Cardoza in an attempt to get some of their taxpayers’ money back; by coincidence Cardoza’s lawyer in those proceedings was Emma Edhem, who appeared in this column a couple of weeks back in a successful attempt to be elected as an Alderman of the City of London. Defending for Labour is Anjona Roy, an equality activist and Corbynite who last year lost the Labour selection contest for Northampton North (to Sally Keeble, the MP for the seat during the Blair and Brown years, who lost in 2010 and has been trying to get back ever since). The Lib Dem candidate is Martin Sawyer, who performed decently in a borough by-election for Eastfield ward last year. The Conservatives have tried to cover their weak points in the division by selecting someone who no doubt has a good knowledge of the area through her work: she is Ausra Uzukauskaite, a letting agent. Completing the ballot paper are Andy Smiles for UKIP and Scott Marbutt for the Green Party. Oxford council; caused by the resignation of Liberal Democrat councillor Ruth Wilkinson who had served since 2008. No, I don’t intend to jump the shark just yet. This is Untitled 1986, or 2 New High Street, Headington, which for almost 32 years has been surprising visitors to Oxford. My thanks to Wikipedia for the photograph. The Headington Shark lies at the centre of Headington, an eastern suburb of the city of Oxford along the road to London. This is an old area – Stone Age remains have been found by archaeologists, and there was a hunting lodge here for the Anglo-Saxon kings – but its development got going in the early twentieth century, before Headington was incorporated into Oxford in 1929. The ward’s economy is dominated by those twin behemoths of left-wing policy, health and education; and Headington is an internationally-noted centre for medical research. Within the boundary are Oxford’s main hospital, the John Radcliffe; the Nuffield Orthpaedic Centre; and Ruskin College, which is affiliated to Oxford University and specialises in educating adults with few or no qualifications. Partly because of that history Ruskin College has educated a large number of Labour MPs including two currently serving, Dennis Skinner and Judith Cummins; John Prescott, deputy prime minister under Tony Blair, is another Ruskin College alumnus. The noted philologist and Lancashire Fusilier J R R Tolkein lived in Headington ward for some years, and he was one of many Oxford dons who have settled in the ward. Over 60% of Headington’s workforce hold degrees, a figure in the top 50 wards in England and Wales; and Headington also makes the top 75 for the census “higher management/professional” occupational group. This column has seen many wards where the Liberal Democrats were competitive or dominant until the Coalition and collapsed thereafter; but Headington is an unusual example of that treatment being meted out to the Conservatives. 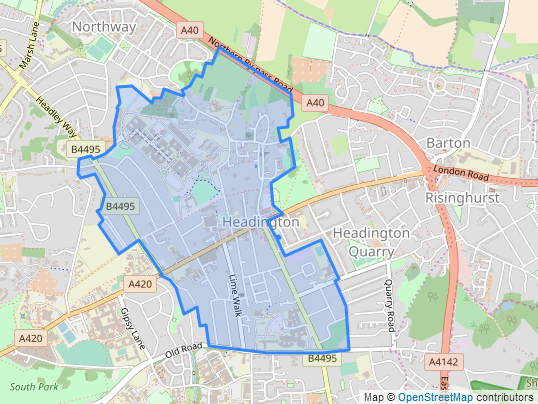 The Tories polled decently in Headington during the Noughties, and in 2008 came within eighteen votes of beating Ruth Wilkinson at her first election. That was and remains the closest the party has come to winning a council seat in Oxford since the 1990s. Labour took over second place in 2010 but it’s a rather distant second: in May the Lib Dems were winning here by the score of 61% to 27%. The local county council seat, Headington and Quarry, is also safely Liberal Democrat. Defending for the Lib Dems is Stef Garden; as an NHS nurse she is a perfect fit for the ward’s employment profile. The Labour candidate is Simon Ottino, a schoolteacher. Completing the ballot paper are Georgina Gibbs for the Conservatives and Ray Hitchins for the Green Party. West Lancashire council; caused by the resignation of Conservative councillor Paul Moon who had served since 2016. For our rural English by-election we are in a little-visited corner of Lancashire. Look at a map of Lancashire and one thing which sticks out is that there is no crossing of the Ribble estuary downstream of Preston; and one good reason for that is that the estuary’s banks are extensive saltmarsh on both sides. 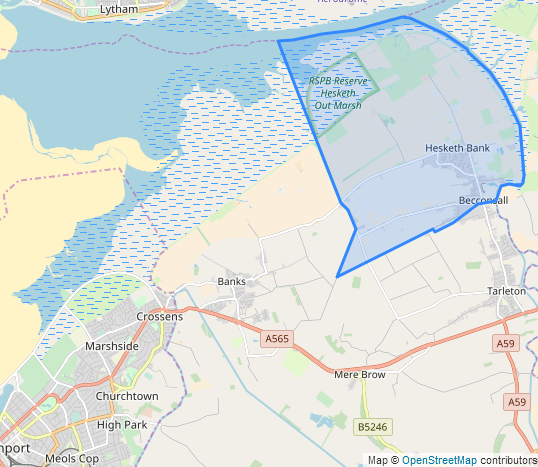 The south side is particularly indented thanks to the Douglas estuary, which joins that of the Ribble; between the Douglas and the town of Southport lie a series of small and rather isolated agricultural villages, the so-called Marsh Towns, of which the largest is Hesketh Bank. Hesketh Bank is known for a steam railway museum, and not an awful lot else. As can be seen there’s lots of water around here, but unfortunately little of it is drinkable; and as a result of the current dry and hot weather the local water company, United Utilities, is about to impose a hosepipe ban. Fun news for the local farmers. Although the main service centre for the Marsh Towns is Southport, they are in the South Ribble constituency with Leyland, and they have Preston postcodes, Hesketh Bank lies rather uneasily in the West Lancashire local government district which is based on Ormskirk and Skelmersdale to the south. Which probably rather adds to their sense of isolation. Looking at West Lancs’ local election results takes you into a bit of a timewarp, as none of the parties outside the big two are organised here and the level of polarisation between the districts’ wards is something to behold. There are wards in Skelmersdale where Labour break 90% in a good year, and village-based wards which can easily turn in an 80% Tory vote. Hesketh-with-Becconsall is a Tory ward but not to that extent. There have no changes to its boundaries since West Lancashire’s founding electoral arrangements in 1973, in which it returned an independent councillor who lost to the Conservatives in 1976. The Tory vote was split by an Independent Conservative in 1984 leading to Hesketh-with-Becconsall being lost to the Liberal-SDP Alliance by just two votes; the Alliance councillor was re-elected in 1988 but lost his seat back to the Conservatives in 1992. Hesketh-with-Becconsall has been consistently Conservative since then, and was granted a second councillor by the Boundary Commission in 2002. The ward’s results since 2010 have all been in the range 60-70% for the Conservatives and 30-40% for Labour, with May’s election putting the Tory lead at 60-31. That election saw the Lib Dems contest the ward for the first time since 1992 – and there are good reasons for Labour and the Lib Dems to put some work in here even though a win looks unlikely. If the Boundary Commission proposals go through this ward will transfer into the Southport constituency, which after some huge vote swings in the last couple of years is suddenly looking like a three-way marginal. In May Labour broke through to win council seats in Southport for the first time in decades, so clearly something is going on in the town. One to watch for the future. Another fly in the ointment is that this by-election might be seen as unnecessary. The outgoing councillor Paul Moon was elected in 2016, at which point he was already a Wyre borough councillor for Preesall ward, on the northern coast of the Fylde peninsula. Preesall is over thirty miles from Hesketh Bank by road, and that will take over an hour to drive even if the traffic in Preston town centre is in a good mood. Perhaps not surprisingly Moon has found that he can’t handle both representative jobs at once. So we have a by-election. Defending for the Conservatives is Joan Witter. The other two candidates both give addresses in Hesketh Bank: Nick Kemp returns from May’s election for Labour, and Hesketh-with-Becconsall parish councillor Steve Kirby is standing as an independent. Bury council, Greater Manchester; caused by the resignation of Labour councillor Elizabeth Fitzgerald who had served since 2012. The BBC have annoyed a lot of politics types this week, with the announcement of cuts to the programming of the BBC Parliament TV channel. The channel’s original content is being discontinued, and there will no longer be broadcasts of any sort during weeks when Parliament and the devolved assemblies are not sitting. Professional politicians will have noted that this will mean the end of live broadcasts of the party conferences; amateur psephologists will fear that BBC Parliament’s occasional practice of indulging us with repeats of historic election nights may have come to an end. Both of those groups will surely agree that this move is regrettable. It’s not the only BBC programming cut which has annoyed your columnist this year. A couple of months ago, a reorganisation of the Radio 2 schedules spelt an end to a programme which has been going in some form or other since 1946, Listen to the Band. Psephologists may have politicians to speak up for them, but the brass band movement doesn’t enjoy that advantage. Which is a shame, for brass banding has a rich and long history to call its own. As the clip above shows, it was once seen as sufficiently important for the BBC to devote half an hour of TV time to high-quality but amateur ensembles like the Besses o’ th’ Barn Band. Besses have fallen on hard times in recent years but in their heyday were absolutely in the top rank of banding: the band undertook two world tours in the 1900s, and the programme above gives an idea of their history while also showcasing Besses (and Bury Market) as it was 35 years ago. There aren’t many places which have been put on the map by their brass band, but Besses is definitely one of them. Besses proper is just one corner of the ward named after it. In population terms the core of the ward is the Hillock, Elms and Victoria council estates along Thatch Leach Lane, Ribble Drive and Mersey Drive. Hillock in particular is a Manchester overspill estate and relatively successful as overspill estates go; on the other hand, the Thatch Leach Lane area hasn’t recovered from the mid-1990s proposal to flatten the area for a new motorway to be built parallel to the M60. 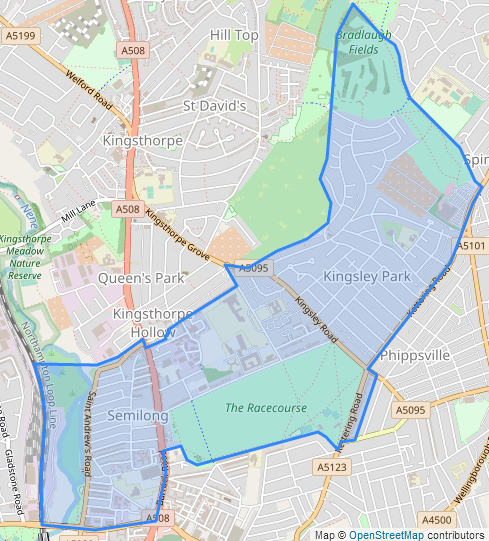 In 2004 an area to the north, as far as Unsworth Pole, was added to the ward; this is a relatively well-off area but doesn’t change the characterisation of Besses ward as a whole as strongly working-class. It’s also a safe Labour ward. Recent electoral comment on Bury has focused on Prestwich and Whitefield being strongly Jewish areas and on the impact that might have on the Labour vote, but as far as Whitefield goes that characterisation is only half right. 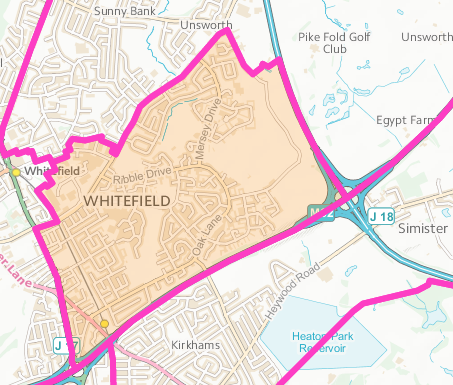 The Jewish population of Whitefield is indeed large but it’s concentrated in Whitefield’s other ward, the much more affluent area of Pilkington Park. Besses is a safe Labour area, where in May the party led the Conservatives by 60-23. Third place here is traditionally taken by right-wing populist and local resident Stephen Morris of the English Democrats, although his 7% in May was at the low end of recent performances. Morris was also the English Democrats candidate in the Greater Manchester mayoral election last May, finishing fourth in his home ward with 5%; Andy Burnham led the Conservative candidate Sean Anstee 62-22. Labour have kept it in the family with their selection: their candidate is Prestwich resident Lucy Smith, whose parents John and Stella Smith have both served as mayor of Bury. The Conservative candidate is Jordan Lewis, who lives in Whitefield and works in public transport. Also standing are Stephen Morris for the English Democrats, former Labour Bury councillor Glyn Heath for the Green Party, Gareth Lloyd-Johnson for the Liberal Democrats and Michael Zwierzanski for UKIP.